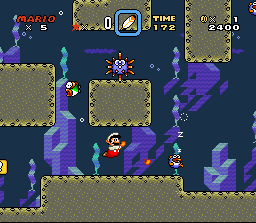 Forest of Illusion 2 is an underwater level in the game Super Mario World. It can be accessed through the completion of Forest of Illusion 1 or Forest of Illusion 4. By completing this level, the player gains access to Forest of Illusion 3. Near the end of the level, there is a Keyhole that brings Mario or Luigi to a secret exit. By using this exit, the player gains access to Blue Switch Palace. This is the second level to appear in the Forest of Illusion. Forest of Illusion 2 takes place underneath a lake and is the first level to feature Urchins. There are many Blurps that swim towards the player and go off the screen. Near the end of the level, there is a whistle-blowing Chargin' Chuck that wakes up all Rip Van Fish in the area. On the left near the end of the level, there is a Keyhole hidden behind a false wall near the yellow ! Block that brings Mario or Luigi to the Blue Switch Palace; it is also highly populated with Rip Van Fish. This page was last edited on April 9, 2019, at 02:55.